Thank you so much to the many of you who have responded with emails of encouragement, gifts for the Moldova van project and just the reassurance of your prayer for us as we travel. We are so grateful for your continued support. It has been wonderful to see many of our US friends while we have been in the States for this last month. You are so precious to us here at Heartcry. Firstly I want to share some great news with you. We have been able to raise the $ 10,000 needed for the mini-van for the girls in the refuge home. We have transferred the money for Johannes and Charlotte to be able to purchase the vehicle and look forward to being able to present them with this additional tool to help them share the gospel in this precious nation. What a great blessing this will be – THANK YOU! March has been a month of travel in the US. We started the month on the west coast in Everett, Washington state, at a prayer conference and finished on the east coast prayer walking the city of New York before a final church weekend in Catskill, NY state. This has been a month of teaching on prayer, writing about prayer and actually taking time to walk and pray! The first weekend was a powerful conference called ‘Restore the Roar’, at Sonrise Church with Pastor Dan Hammer. On the Thursday we had the opportunity to speak to all the global leaders and then open the conference. Helen and I both taught alongside other speakers giving both prophetic insights into this season in the USA and instruction about how to pray. One phrase that God gave me seemed to resonate through this time – ‘The Lion has roared – the Eagle has landed!’ I feel that the Lion of Judah is roaring in the Heavens and this is a season of opportunity for the prophetic dreams and vision to ‘land’ and be fulfilled. There is a time for the prophetic to soar in the heavens but then comes the time for the Word to land and become part of history and reality. This is the Year of Breakthrough and so we must take our opportunities and watch the prophetic words land in our nation. After the conference Helen and I remained in the Seattle area for our board meeting, a ladies prayer group and an evening with Destiny Life Church. Each of these times were special although different in nature but the hunger for God, desire to pray for the nation of America and generosity of heart was present at every gathering whether large or small. God is stirring the hearts of people to watch and pray in these days. During this two weeks I also took time to edit my new book on prayer. It is called ‘I LOVE PRAYER-Connected to God and Changing the World’. Although the manuscript has been finished in rough form for nearly one year I have not had the time to read it again and complete the final edit. However over the last few weeks I have had such a sense that NOW is the time for this book to be published. So I have taken every free moment to write and edit this manuscript and I finished it TODAY!! Now I will send it for an editorial proof read and then we should be ready to print and the book should be available for sale by July 2017. Yes – mission accomplished, almost! Although I have been writing furiously whenever it has been possible we have also spoken at two other conferences. Helen and I spoke at a ladies conference in Buckley, WA, on the theme ‘Be brave!’ the second weekend in March. Here we spoke about the bravery it requires to be transparent and to live without shame and then be a voice into our communities. The next conference was also a women’s conference but this time in Idaho on the subject of Faith. Here Helen took the Friday night and explained the principles of faith in such an accessible but dynamic way. Many were saved, rededicated their lives to Jesus and were filled with the Holy Spirit over these days. One new Christian walked back into the room after lunch and entered the hall as we were praying for the sick. Instantly the power of God touched her body and severe back and shoulder pain that had been crippling her left and even the next morning she was still glowing and telling everyone she could about her story! God was so good and it is wonderful to watch the joy on the faces of new believers. Finally we have completed this trip on the east coast in New York City. Here we have walked the streets and prayed for this place. We have visited the United Nations, Ellis Island, Ground Zero memorial, Trump properties and other institutions and prayed for America. We sensed some of the wrestling of this season which people in the larger cities experience so acutely. 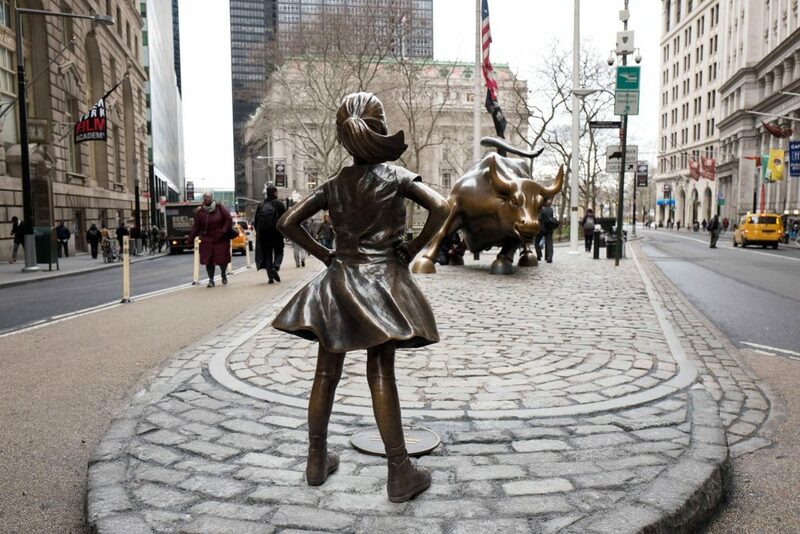 In Wall Street we came across the statues of “The Raging Bull and Fearless Girl” (pictured). It spoke to us so profoundly of the need for an innocent Bride, the Church, to stand her ground, confident in the face of all the intimidations of this season, and declare that she will not be moved! While we were here, Wall Street had one of the worst days on the financial markets for some time as uncertainty about the future direction of the nations continues to unsettle many. The stress on the people in the financial district was so evident and we felt great compassion for them as we prayed. The same day, we heard of the tragic events taking place on the streets of London and prayed for our capital city to know God’s peace and security. But in the midst of all the turmoil there are great opportunities for the Gospel and we are seeing that what the enemy intends for evil, God really does turn around and use for good. We just need to ensure we are rightly positioned in this season to seize every opportunity. As we write, before catching the plane home, we will preach at one more weekend, again on the heart of prayer, at Community Life Church in Catskill.